Yes, even in generally sunny and mild Louisiana, this afternoon, it was a crushing 22 degrees. Almost as soon as the sky brightened, it fell back into darkness. These are short and bitter days: full-on winter. Yet, in the midst of this unbearable cold, I read in my gardener’s journal that I should be out planting. I’m late putting in kale. My pansies are long overdue. And, if I want daffodils, jonquils, or tulips for spring, they must go into the frozen ground this week. I need to dig out my gloves and spade, bundle up, and get to work. But in the freezing darkness, I must admit, I have little motivation. Then, I think of George Harrison. I think of George in those dim and sunless days after The White Album, when (for the most part) his genius was ignored and his contributions to The Beatles, largely overlooked. It was “the winter of [his] discontent,” but in those seemingly barren days, instead of despairing, George began planting. 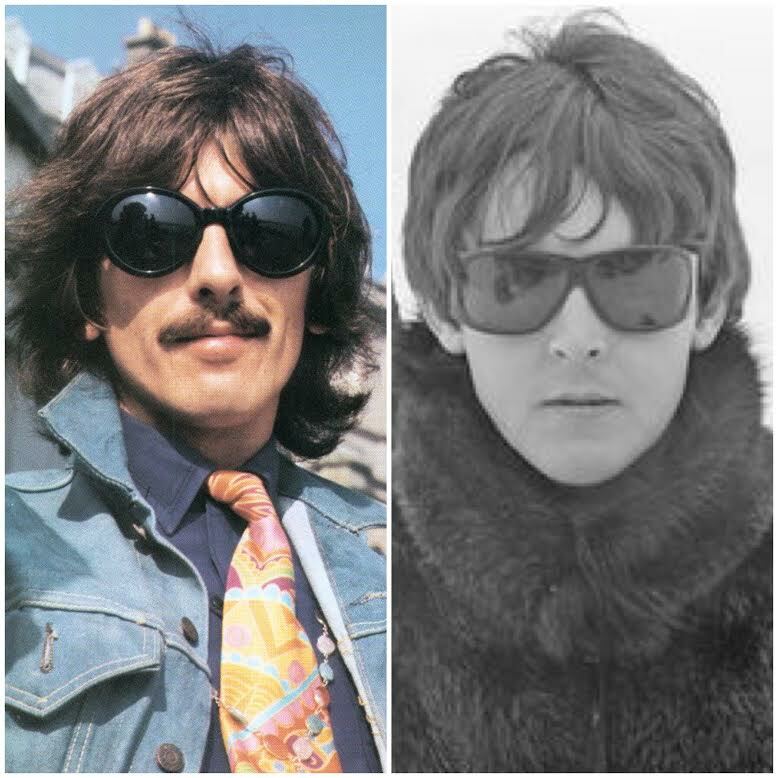 When John and Paul shrugged him off and pushed their own projects forward, it would have been easy for George to doubt himself. It would have been reasonable for George to buy into the attitude that he was “second best.” (Or third best, as it were.) 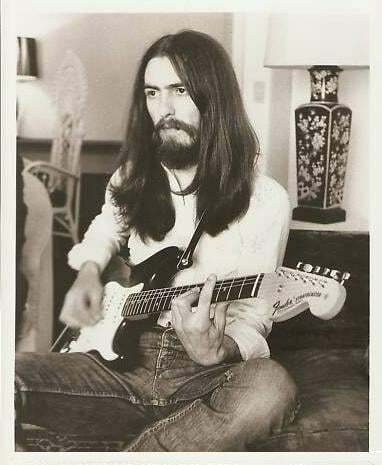 Instead, continuing to believe in himself and in his ability to be fruitful, George used that fallow time to begin writing “My Sweet Lord,” “Isn’t It a Pity?” and “What is Life.” Fully confident that “it’s not always going to be this grey,” George began quietly preparing for a bright harvest that would shock those who had swept him aside. He began penning, editing, and improving the songs that would – almost two years later – grace his double GRAMMY-nominated (for “Best Album of the Year” and “Best Single of the Year”) album. He began creating All Things Must Pass. In a very dark time, George quietly tilled the fertile soil of his imagination, carefully planting seeds that would flourish into that triple-album bearing the greatest creative work of his career. 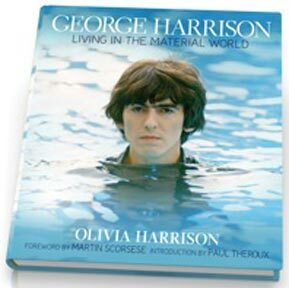 In a wry twist of fate, had The Beatles embraced George’s plethora of compositions during 1968 and 1969, the accomplished Harrison would not have compiled the elegant and varied catalog that fills All Things Must Pass. 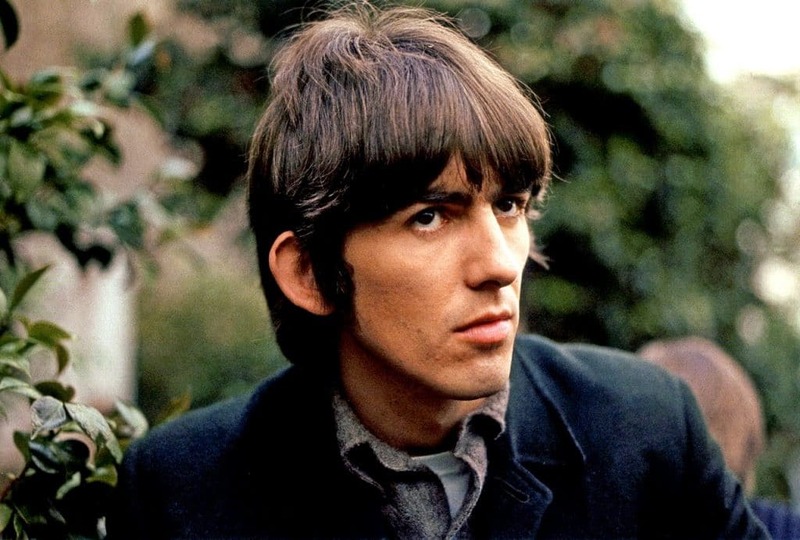 As music critic Ritchie Unterberger adeptly observed, the album was filled with “[George Harrison’s] backlog of unused compositions from the late Beatles era.” Indeed, the “shadowy winter” that engulfed George’s last two years as a Beatle was necessary; it furnished a quiet time for him to create a genius solo album. And so, like George, I resolve to plant. I resolve to make the most of an uncomfortable, bleak, and lonely season. Instead of letting darkness defeat me, I resolve to use it as an instrument to come back stronger, more vibrant – full of fragrant blooms. I wish you a time for planting, too. I wish you a New Year full of quiet moments in which to plan and grow. May every season of 2018 be used to good purpose…even the most frozen moments that seem to have no potential. George found them a blessing. May we as well. 2. From “All Things Must Pass” by George Harrison on the All Things Must Pass LP, 1970. And yes, I grasp the vaguer meaning of this phrase: “Love you two.” (As in: “I love John first, but I love you two”). Or… it could be an unfinished infinitive waiting for a following verb. (As in: “Love you to love me.” Or “Love you to listen.” Or “Love you to comprehend what I’m saying”). But as George Harrison’s title stands – without any other nouns, verbs, or explanations to complete it – the phrase is incomplete, unclear, and ambiguous. And really, that is where George Harrison was when he penned this 1966 song. Recently returned from a trip to India where he had begun sitar studies under Ravi Shankar and the study of the Hindu religion, George was an excited newbie. He was completely enthusiastic, but green – an amazed young man muddling through the murky waters of a complex, new faith and an equally complex mode of musical expression. George was a bit overcome. The brevity of existence kept bothering George, niggling at him – and those beliefs transformed his love song into a serious warning refrain: a song about living not only for today, but also living a life worthy of the hereafter. Before I’m a dead old man! It was a bit depressing. As the song neared its close, George struggled to find something to smile about, to celebrate. And in 1966, George reached the same conclusion. He decided the very same thing. At the end of his song, he advised Pattie (and all of us) to go for the gusto! To grab happiness while you can! To smile while you still have teeth! Make love all day long! he advised us. It was the only viable solution to mortality that George could offer. By The Summer of Love (1967) when George released “Within You, Without You” as the opener for Side 2 of Sgt. Pepper’s Lonely Hearts Club Band, both his faith and his acumen on the sitar had reached a higher plane. By then, he was able to speak with more depth and wisdom. But here on Revolver, George is clearly grappling with a vast belief system and an intricate musical genre, so he falls back on immediate gratification as a ready, easy solution. Or maybe…maybe George’s answer was, in fact, the very best solution anyone could offer. In 1967, John Lennon would so famously tell the world that, “Love is all you need.” And here, George is voicing the exact same sentiment. In light of death, aging, and fleeting existence, the youngest Beatle turns to Pattie and to us, advising everyone to cling tightly to love. Sage advice, I think. Perhaps our kid wasn’t such a newbie after all. Today in Boston, New York, Washington, D.C. and even Louisiana, COLD has gripped the nation. The sky is “a hazy shade of winter” (with nods to Simona and Garfunkel). We are locked in The Grey Zone…those interminably dark days just before Spring. And for some people, it’s pretty darn depressing. Little darling, it feels like years since it’s been here! Sure, we know the words. We all know the lyrics, but applying them to life is another story. Last week, I visited New Orleans for Mardi Gras – something we Louisiana girls do as a natural part of our heritage. But this time, instead of doing the “same ole, same ole” thing, I sought out new sights, new inspirations to dispel winter’s gloom. 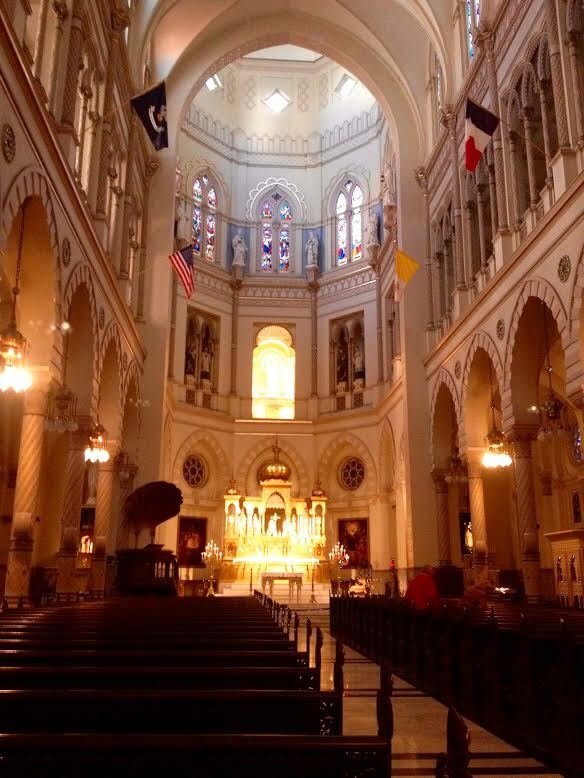 And I found the towering, breathtakingly lovely Church of the Immaculate Conception on Baronne Street, close to the French Quarter. 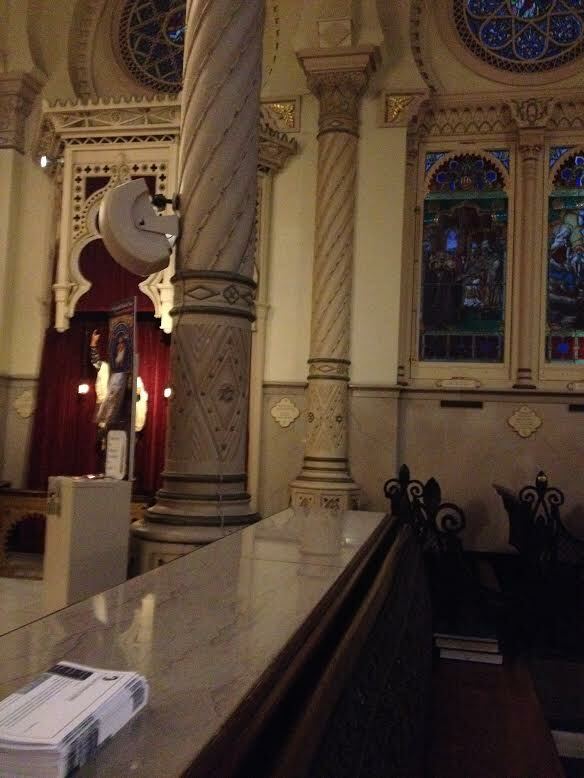 After walking miles and miles, I finally located it, opened the immense, wooden door, and stepped quietly inside. This is what I saw. Outside it was freezing: windy and raw. But inside, I discovered a haven of loveliness. For many minutes, I sat in silence and looked all around, taking beauty in. I sat alone and listened. I noticed. To my left was a window shaded sheltered in an alcove, set apart. I looked at it for a long time. 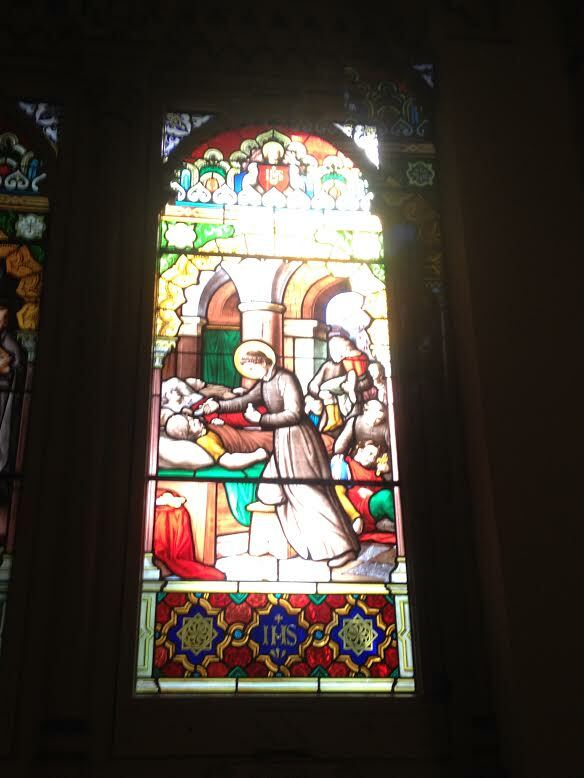 Then my eyes wandered to a second window farther down the wall, burning with light. What a lesson was there! 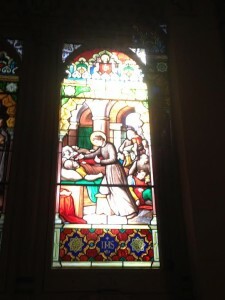 The windows were identical: constructed of the same stained glass and oak, designed by the same brilliant artist, created in the very same year. The single difference in these two works of art was that one shone in the sun and the other one sat in darkness. That afternoon, I began to think of the window to my own soul…and how dark I’ve been lately as I’ve cared for my aging father, traveling miles upon weary miles each week, to be with him. I thought of how sorry I’ve felt for myself as I’ve had to sacrifice my writing and progress on The John Lennon Series to do the very uncreative but necessary tasks that care-giving demands. I thought of how gloomy I’ve become as my life has taken an unexpected change. Over the past year, without realizing it, I’ve become that isolated window drenched in shadow. Darkened. A lovely bit of poetry? Yes. But it’s more than that. In that closing words of that song, Paul was making a decision; he was consciously choosing to follow the sun. And whether we sing about it or not, we are also called to decide. Each day, we’re given the option to turn our faces to joy, hope, and happiness….or to turn away. I don’t want to be an unlit window. I don’t want to chill others with my “hazy shade of winter.” I want to shine again. And Shine On. Do you? Here comes the sun. It’s all right! ***Speaking of sun, Lanea Stagg’s e-book, Little Dog in the Sun is #1 on Amazon e-books today. Lanea has been part of the Fest family for several years, and her book is all about choosing to live in the sun…and to live life in joy after the death of a loved one. It’s a gorgeous children’s book that really represents what the Fest is all about. HEAD HERE to purchase a copy of Lanea’s book. November 29th – On this day in 2001, George Harrison passed. 12 years of reflecting on his singular legacy he left on this planet doesn’t make it much easier. Yes we do have his incredible music to put a smile on our faces, to make us think about the world, and how we fit into it, to improve the human condition, to improve ourselves, and to enjoy life more! That, in itself, is an enormous achievement. On that note, we make our yearly plea to those of you who still smoke cigarettes. Smoking leads to lung cancer and this is what took George from us. He didn’t know it in the 50s when he became a teenager. But now everybody know that cigarettes kill people – 1,200 every day, just in U.S.. That is more than 430,000 people every year. And it doesn’t just affect the smokers, but thousands die every year from second hand smoke. So for those of you who still smoke, we urge you, on this day we remember George, to finally give them up and mean it this year. You and your family and friends who love you will be thankful. Now let’s all go listen to George’s music today.